A 1-ounce serving of fresh wheatgrass juice has 5 calories, 1 gram of carbohydrate and 1 gram of protein. A 1-tablespoon serving of wheatgrass powder has 35 calories, 4 grams of carbs, 2 grams of fiber and 2 grams of protein. 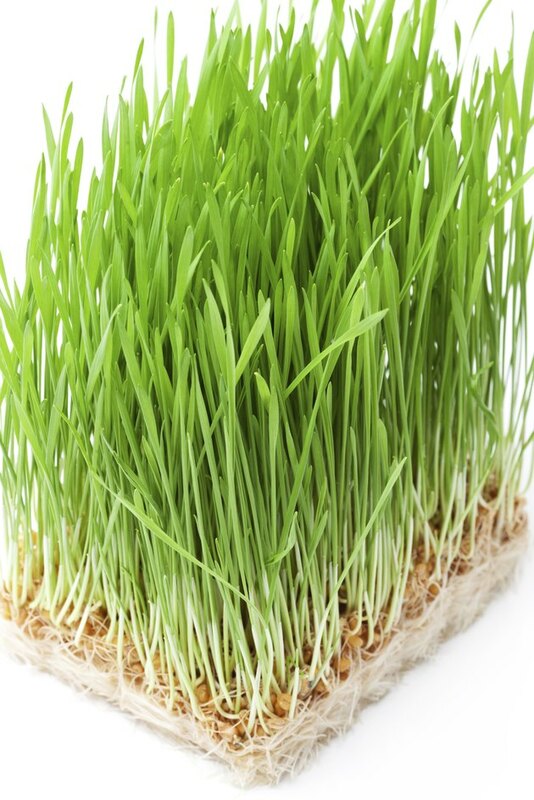 Wheatgrass is a rich source of vitamin A, C, K, a variety of B vitamins, iron, magnesium and iodine. The powdered version is a more concentrated source of nutrients than the fresh, simply because there's more wheatgrass present per serving. Some proponents of wheatgrass claim the dietary supplement may aid in your weight-loss efforts by helping suppress appetite. However, this is based on anecdotal evidence, not scientific research. While there's no evidence that wheatgrass helps promote weight loss, the low-calorie dietary supplement may serve as a concentrated source of nutrients when you're limiting your calorie intake to lose weight. In fact, the supplement is thought to have antioxidant properties, which means it may help you fight cell damage by free radicals and lower your risk of chronic diseases such as heart disease and cancer. There's no special food or supplement that's going to help you lose weight without you first reducing your calorie intake. You lose weight when you eat fewer calories than your body needs. No matter what the source, all the calories you consume count. You need to count those coming from your wheatgrass supplement as part of your overall intake to help you stay on track for weight loss. Wheatgrass is considered a safe supplement, according to Columbia Health, but that doesn't mean there aren't potential side effects. The fresh juice is bitter, and some people may experience nausea or vomiting after ingestion. Also, you should not include wheatgrass in your diet if you have celiac disease or an intolerance to gluten. Wheatgrass is a sprout consumed raw, and when drinking the fresh juice, there is a potential for bacterial contamination and foodborne illness. Columbia Health: Is Wheatgrass as Groovy as They Say It Is?